More than 100 acres of eelgrass have been lost in Chilmark ponds since 1995, says marine biologist. A sharp increase in the annual town operating budget and the question, both financial and philosophical, of whether to continue participation in the Massachusetts Estuaries Project are the key issues that will come before Chilmark voters at their annual town meeting Monday night. The meeting begins at 7:30 p.m. in the Chilmark Community Center; longtime moderator Everett Poole will preside over the 22-article warrant. The annual town election is Wednesday. The $7.6 million town budget is up $602,690, or 8.6 per cent over last year. The increase can largely be tracked to higher school assessments and the cost of borrowing for rebuilding the Menemsha pier that was destroyed in a fire nearly two years ago. Education spending in Chilmark totals $2.7 million and accounts for 35 per cent of the town budget this year. The town’s regional high school assessment increased from $518,000 to $704,000, while the up-Island regional school district assessment increased from $1.9 to $2 million. Overall education line items are up 12 per cent over last year. If voters agree, town employees will get a three per cent cost of living adjustment this year, up from 2.6 per cent last year and none the year before. This is also the first year the town will begin retiring debt from the $1.3 million town pier project that was completed last year. The debt will be paid off over 10 years, beginning this year with a payment of $130,000. Possibly the most pivotal issue to face Chilmark voters this year involves funding for the state estuaries project which has been ongoing in all Vineyard towns for several years. Using sophisticated high-technology modeling techniques to track sources of pollution, marine scientists from the University of Massachusetts at Dartmouth are involved in mapping and writing reports for a series of 89 saltwater ponds and coastal embayments throughout southeastern Massachusetts. The Massachusetts Department of Environmental Protection is co-sponsoring the project. Two articles will come before voters involving the estuaries project. In one, voters will be asked to spend $14,490 to enroll Menemsha, Squibnocket, Nashaquitsa and Stonewall ponds in the program. The article originally called for $31,767 but is expected to be amended down on the town meeting floor due to private donations from pond abutters that will go toward the project. Voters will also be asked to spend $54,500 on a Chilmark Pond study. When the issue came up this winter for inclusion on the annual town meeting warrant, selectmen were sharply critical of the estuaries study, noting that the town had spent $40,000 on the Tisbury Great Pond study with no tangible results. But at their meeting this week, selectmen had moderated their tone, noting in particular the presence of matching state grant money for the work. “This is a state matching situation, which is why we want to approve funds this year,” said outgoing selectman and board chairman Frank Fenner. “We will get out of this a base line and information for future grants going forward,” he added. “We’ve been doing this for years . . . but hopefully this time we’re going to get somewhere,” said selectman Jonathan Mayhew. Both warrant articles have companion ballot questions in the annual town election Wednesday to exempt the spending from Proposition 2 1/2, the state tax cap. Dr. Brian Howes, a marine biologist and technical director for the estuaries project, told the selectmen in December that more than 100 acres of eelgrass were lost between 1995 and 2006 in the Chilmark, Squibnocket and Menemsha Pond Systems, mostly due to excess nitrogen in the water. At the selectmen’s meeting Tuesday Squibnocket Pond Association chairman Wendy Weldon said the estuaries study work is critically needed. The cost for the Chilmark Pond study was originally $74,5000, but a $20,000 in-kind contribution from the Chilmark Pond Association helped reduce the cost. Association president Joan Malkin said a $20,000 bathymetric study was paid for privately, and the association will share the results with the estuaries program scientists. Mr. Doty said though Chilmark Pond is smaller than the Menemsha Pond system, the cost of the study is more because it is being paid for solely by the town. The town shared the cost of the Menemsha Pond system study with Aquinnah and the Wampanoag Tribe of Gay Head (Aquinnah). At the town meeting, voters also will be asked to approve a series of transfers from the general fund for 20 other spending articles, including $15,000 for new fire department equipment and $17,000 for new fire department breathing apparatus, $12,000 for replacement pilings in Menemsha harbor, and $100,000 to put toward post-retirement benefits for town employees. On Wednesday, voters will go to the polls where they will face four ballot questions. 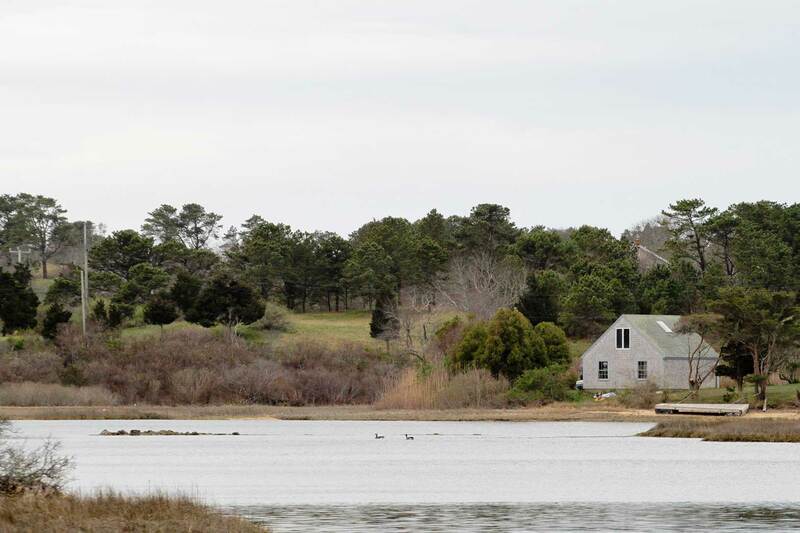 In addition to the two estuaries project questions, voters will also be asked to exclude the debt from the provisions of Proposition 2 1/2 for money borrowed for the West Tisbury School building project last year. Repairs included new siding and shingles to the building. A nonbinding question on whether the roundabout should be built at the blinker intersection in Oak Bluffs is also on the ballot. Chilmark will be the third town to vote its opinion on the roundabout; voters in Edgartown and West Tisbury last week came out overwhelmingly against the project. There are no contests for elected office this year. Four-term selectman Frank Fenner is not seeking reelection, and William Rossi will run for the seat. Mr. Rossi works as a real estate broker in Edgartown and is the owner of the Chilmark Store. At the selectmen’s meeting this week there were warm wishes for Mr. Fenner. Selectman Jonathan Mayhew agreed. “It’s been a real joy,” he said. Yesterday Mr. Rossi said he looks forward to serving the town. Polls are open from noon to 8 p.m. at the Chilmark Community Center. I hope the town votes in favor to spend $14,490 to enroll Menemsha, Squibnocket, Nashaquitsa and Stonewall ponds in the program. And I hope the votes are in favor of spending $54,500 on a Chilmark Pond study. These ponds are the lifeblood of Chilmark and further degradation will be a huge loss.